Corporate education reformers love to harp on the “education gap” between different racial groups as a cause for alarm, focusing on test scores and college graduation rates while blaming teachers for these outcomes. 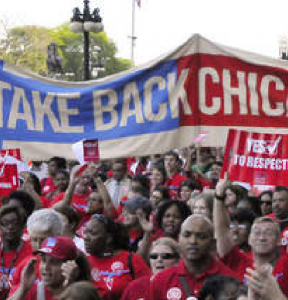 The Chicago Teachers Union, on the other hand, has been arguing that the issues our students and their families face at home and in the community greatly affects their academic outcomes. When this analysis is coupled with an understanding of the vast inequities in access to educational opportunities and funding, and the traumatic effects of school actions, it becomes obvious that structural racism and bad policies are to blame, not “underperforming” teachers. In a new study published by the University of Illinois at Chicago Institute for Research on Race and Public Policy, “A Tale of Three Cities: The State of Racial Justice in Chicago Report,” the intersectionality of areas of racial inequity that are normally researched and treated in isolation are described in detail, in the hopes of promoting cross-collaboration to find solutions to economic, judicial, housing, health and educational disparities. The report shows how policy makers can no longer blindly claim that racial disparities are “unintended outcomes”; they are deliberate, pervasive and getting worse. Many of today’s problems are rooted in policies and practices that have been outlawed for decades, but are exacerbated by the failure to address them. The wage gap is wider today than it was in 1960, even controlling for education and experience, and this situation is specific to Chicago where racial economic disparities are worse than the rest of the country. Businesses owned by people of color are half as likely to get small business loans, and when they do, they only receive a small amount. This greatly affects not only an individual family’s potential for wealth accumulation, but all of the people who would be employed by that business and the community where the business would be located. While outright discrimination in selling houses and in mortgage lending (redlining) have been outlawed since the 1970s, free-market capitalism has allowed the discrimination to persist, resulting in major disparities in home ownership in Chicago and across the nation. African-American and Latinx communities were most affected by the recent foreclosure crisis, and we can see that today in the boarded-up buildings surrounding many of our schools deemed “underutilized” by CPS. Chicago is nearly evenly split between home owners and renters (48 percent to 52 percent, respectively), but the gap widens significantly for Latinx (43 percent to 57 percent) and even more so for African-American residents (34 percent to 66 percent). African-American and Latinx households are also significantly more rental cost-burdened, with more than half paying more than the recommended 30 percent of their income on housing. Research has shown that when children go to integrated schools, they are more likely to grow up and live in integrated families and integrated communities. The hyper-segregation of Chicago’s communities, however, results in hyper-segregated schools. Black, white and Latinx residents that were interviewed by researchers claimed that they wanted to live in integrated communities, yet that is not where they looked for housing and it is not where they ended up choosing to live. Civil rights era activism and legislation from the 1960s, coupled with (or fueled by) the explosion of suburban growth and expansion of private schools, led to massive white flight from Chicago Public Schools. In 1970, one third of the student population was white; today, it is less than 10%. Superintendent Benjamin Willis (of the infamous “Willis Wagons,” which were subpar mobile classroom units provided for overcrowded Black schools in the 1950s and 1960s) defended de facto segregation by saying that kids should attend schools in their neighborhoods. When his successor took office, he pushed for desegregation and the white families fled, resulting in a 50 percent drop in white student enrollment. By now, we should know that separate is never equal. The racial and socioeconomic segregation of CPS schools shows that students of color have less access to educational opportunities than their white counterparts. Black students have the least access to art and music. Most of the capital improvement dollars in the last six years have gone towards new buildings or additions in schools with disproportionate numbers of white students. White students are also disproportionately represented in gifted programs, Advanced Placement and International Baccalaureate courses. Black students were given in-school and out-of-school suspensions at significantly higher rates than Latinx and white students, and the statistics are even worse for expulsion rates. There is a new, devastating result of the disproportionate incarceration of Black residents: “million dollar blocks.” Scholars coined this term to express the economic cost of incarceration on a census block of a neighborhood. Between 2005 and 2009, $550 million was spent on incarcerating residents in the Austin community alone, money that should have been spent on education, training, job creation, housing assistance and health care. The U.S. Department of Justice recently published a report on police misconduct in the Chicago Police Department and deemed it the worst in the nation, stating that racial discrimination permeates the department, from training to supervision. Seventy-six percent pf people who were victims of excessive use of force in the last five years are Black, and 83 percent of youth who experienced excessive use of force by the CPD are Black, while 14 percent are Latinx. Chicago had the highest rate of fatal police shootings in the nation and two-thirds of the victims are Black. Between 2004 and 2013, police misconduct cost Chicago taxpayers $425 million in lawsuits and victim compensation—money that should have gone to public services. Health inequalities are increasing in Chicago. African-American and Latinx residents have less access to health insurance and health education, and as a result participate in unhealthy behaviors (smoking, poor diet, lack of exercise) more than white residents. People of color in Chicago tend to live in “food deserts,” meaning there are not any grocery stores within walking distance from their homes, and they have less access to safe and affordable housing and transportation. White women have higher incidences of breast cancer, but a lower mortality rate than Black women. In five predominantly Black communities, more than 40 percent of women with breast cancer do not survive; the rate increases to more than 50 percent in three of those communities. Infant mortality is three times higher for African-American children than for white children. Low birth weight, which affects a person’s life trajectory and health outcomes, affects African-American children the most due to the fact that Black mothers have the least access to pre-natal care. Lead exposure, which causes learning disabilities, is highest in Black communities. 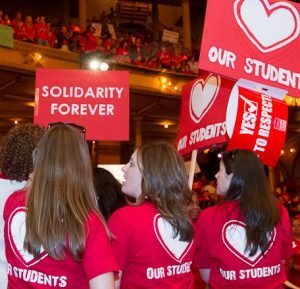 To be the best we can be, CTU members should understand how these socio-economic inequities affect their students and school communities. Understanding the multitude of barriers and obstacles Chicago students and their families face helps us to advocate for just solutions.